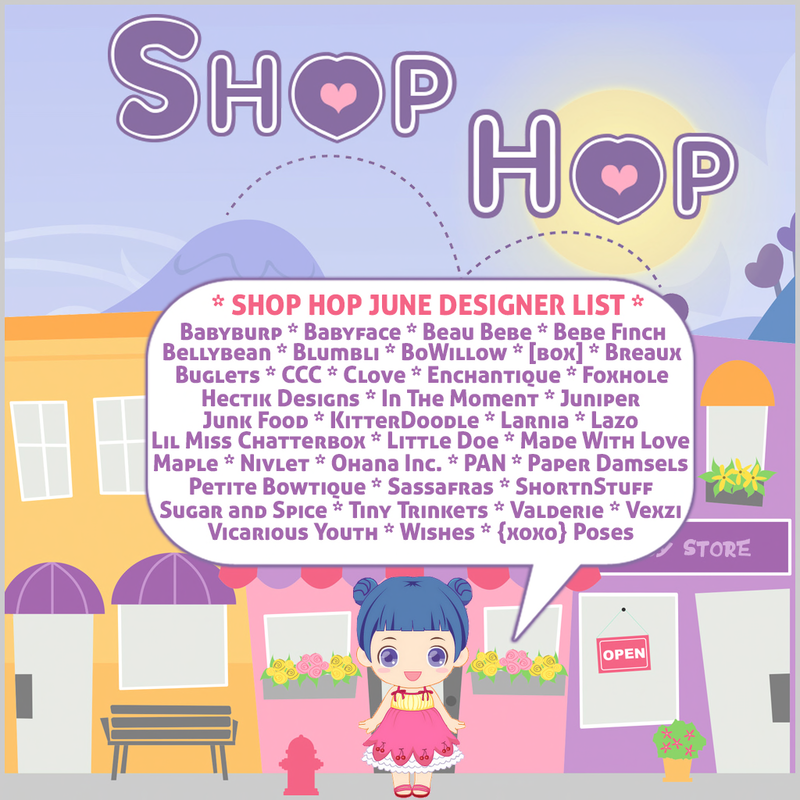 Shop Hop is backkkkk starting June 3rd-June 9th! This coming months theme is School's Out For Summer. lets face it Summer and being out of school is super fun! So now we can dress it! anyways this super cute laid back jammies are from Wishes. for Shop Hop in Baby only.. But it comes in 6 Super cute Summer colors! Next i am wearing some super dope Bento rings from Paper Damsels it comes with a HUD with different colors you can choose from. 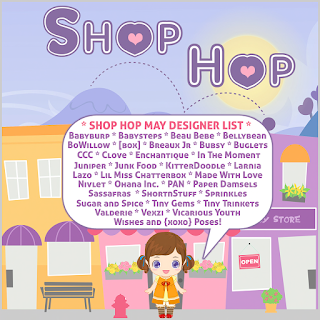 And if your like me and live under a rock and do not know what Shop Hop is *giggles* Its a an amazing kid event that starts the first week in each month. You join the group to get the HUD and once you get the HUD you will be able to teleport to each store on the HUD and you stay their for 1 minute you get a check. once you get all of the checks marks from each store. you will be able to get a free prize, and this months sponsor is Larnia! 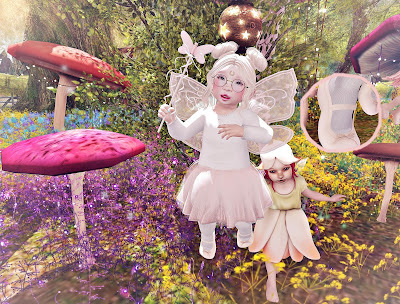 For this post i am wearing a leotard from Pettie Bowtique, super cute Skirt from Ugly Duckling, Shoes from Beau Bebe they also come in other colors you can choose from for tippy toes, Wand and wings from Buglets! 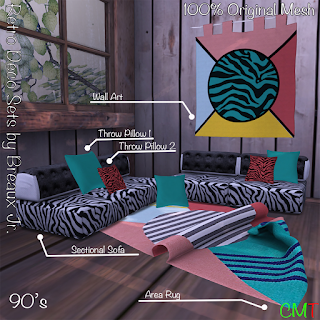 You could get these items from the inworld stores. 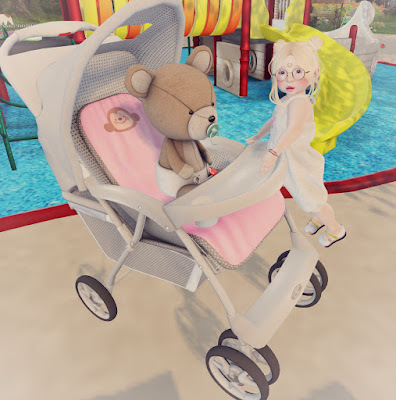 In this blog post i am wearing a super cute swim suit by Buglets for both baby and kid toddleedoo also for this weeks FLF. it comes in other others as well, i am also wearing tippy toes flip flops from Beau Bebe! you can find those at the store in world! They also come in different colors. Happy Shopping! 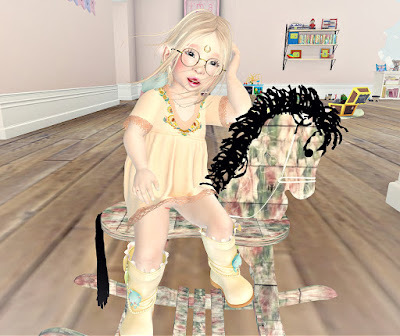 For this post, i am wearing a New super cute outfit from Sweet Tots new release. this outfit comes in both kid and baby toddleedoo. so if you haven't already go check it out at the in world store Happy Shopping! For this post i am wearing a super cute dress from Beau Bebe @ Color me Cute available in other colors, and using family chalk frames from Beau Bebe also. It is a gacha @ Thimble! If you haven't already check out both events Happy Shopping!! 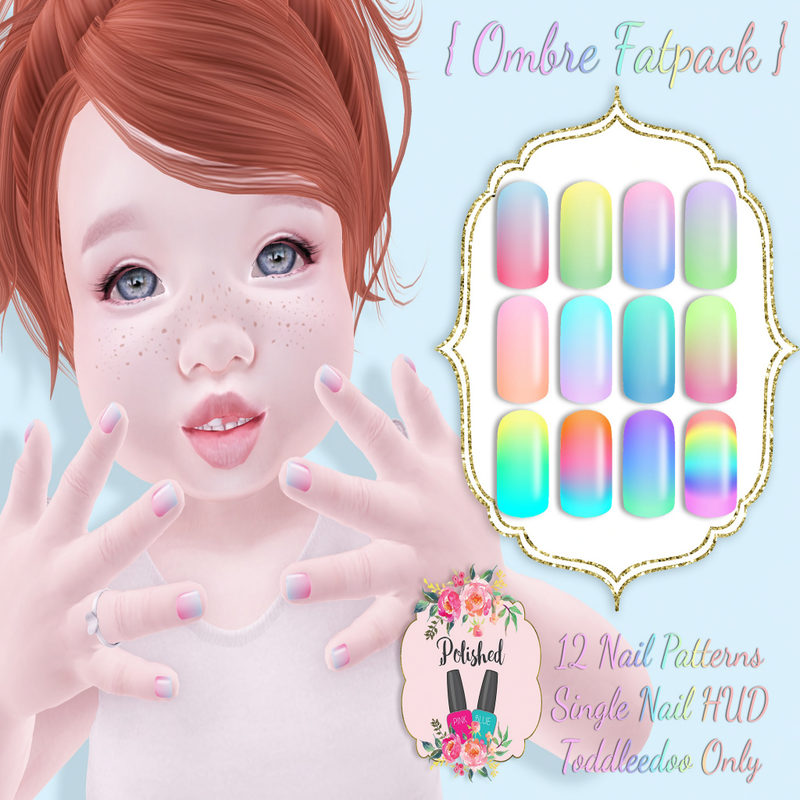 For this post i am wearing super cute gacha items from Babygirl from Thimble , and comes in 3 sizes, toddleedoo baby, kid and bad seed bebe. Comes in 5 colors spring sky, bubblegum, pure, buttercream, mint. 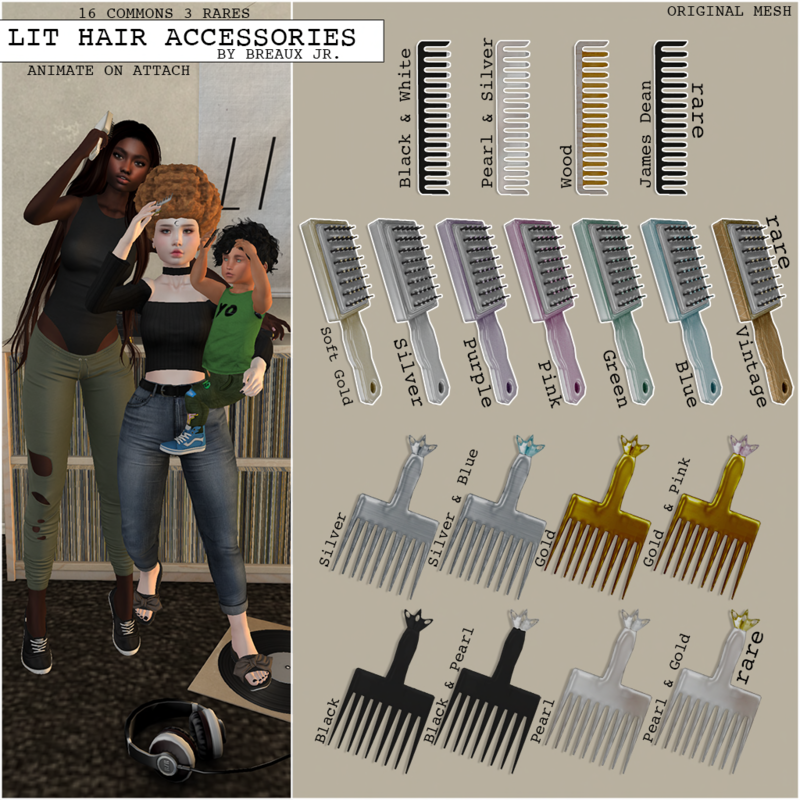 49 linden per go. Happy Shopping! For this post i am wearing a super cute outfit from Pestinhas, from the newest release! this outfit comes in 2 clothes both pink and blue! Happy Shopping! 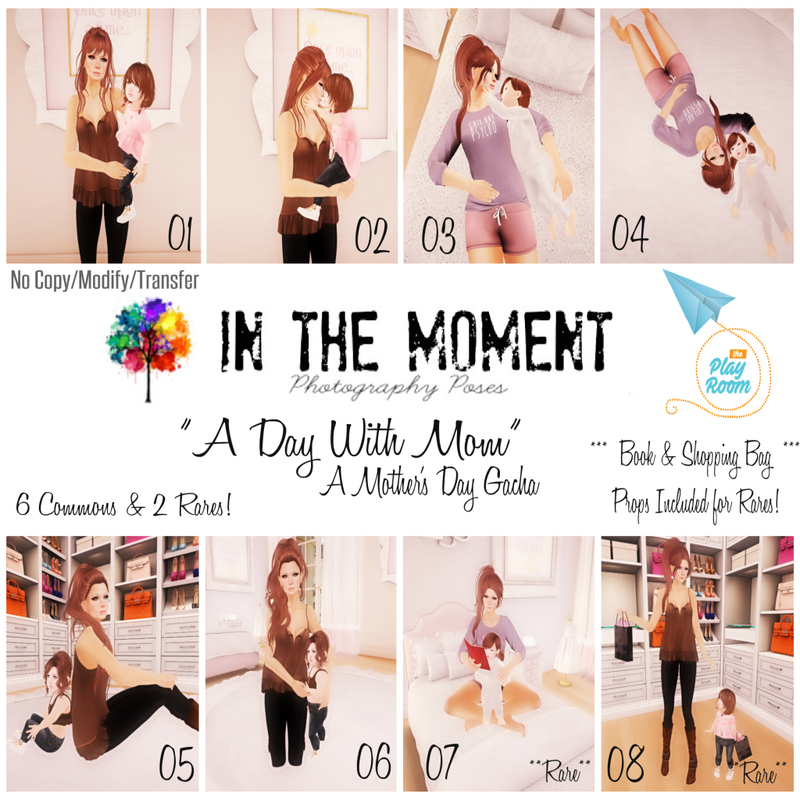 For this post, i am getting help from my mommypie and we are blogging poses from In the moment at The playroom. 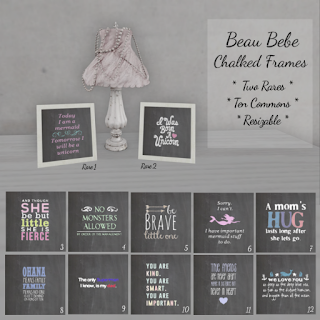 if you haven't already go check out the playroom Happy Shopping! For this i am wearing an outfit from Sugar & Spice new release with an ankle bracelet from Tiny Trinkets. the ankle bracelet is also a group gift. I am also wearing a few other things too but you can see them in the links below! Happy Shopping! For this post i am wearing a super cute swimsuit from Buglets @ Color me cute. This swimsuit comes in different colors and has a HUD for both baby and kid. Its super cute and great for the summer. if you love swimsuits and summer then you would love this. Happy Shopping! For this post i am wearing a super cute shirt from Wishes and mesh made by Babyface! This top comes in different colors and a HUD @ Color me cute. The pants and the flats i am wearing are from Ugly Duckling! Happy Shopping! 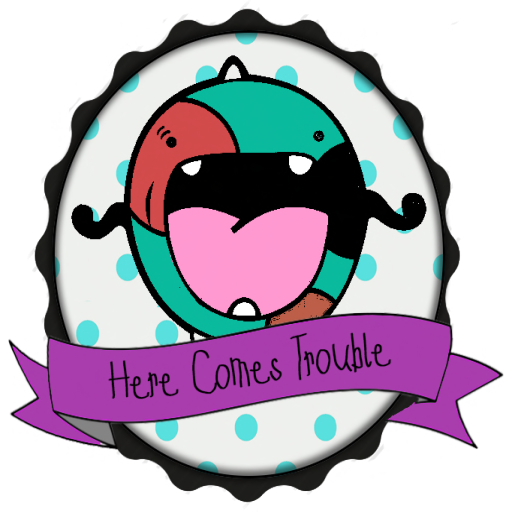 For this post, i am wearing a new super cute outfit from Tiny Trinkets! The dress is at this months Color me cute event, and the sandals are at this months Limited 50! Only 50 sandals well be sold so if you haven't already hurryy and get them before they gooo foreverrrr!!!! For this post i am wearing an outfit from Sweet tots from the new release in both kid and baby toddleedoo. and i am using another prop from Breaux Jr. and wearing earrings from Tiny Trinkets @ LTTL SMALL STYL! 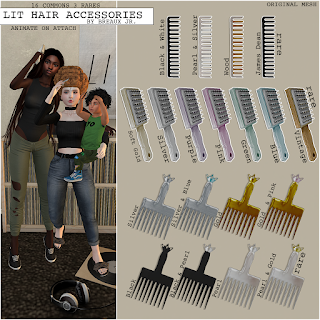 ♥Lit Hair Pick Baby/Kid - Silver - Breaux Jr.
For this post i am wearing a super cute dress from Clove that comes in 8 different colors for both Kid and Baby toddleedoo. The props i am using are from Breaux Jr. The couches have awesome animations! Both items are at Ninety Nine! Now open Happy Shopping! For this post, i am wearing a super cute dress from Clove @ Ninety Nine this dress comes in both kid and baby, and in different colors! The shoes i am wearing is from Wishes, i got them from an outfit and just choose to only wear the sandals! If you have not already go check out Ninety Nine! Sometimes you just have to get down and dirty with the pigs! 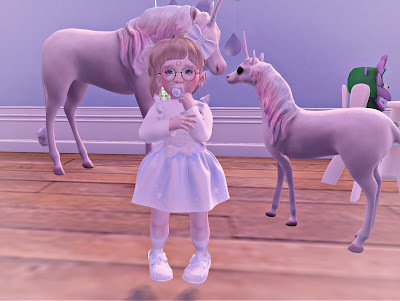 For this post i am wearing a super cute romper from Maple for baby toddleedoo only, available now at Maple in-world store Happy Shopping! For this post i am wearing the shirt from Toasty (idk if its still sold or not), and pants from Maple, @ Once Upon A Child! So if you haven't already go check out once upon a child event Happy Shopping! For this post i am wearing a super cute dress from Clove for Shop Hop, for both baby and kid toddleedoo. The pose/prop i am using is from Dollface @ Ninety Nine! It also have a pose menu you can choose different poses! if you haven't already go check out both events! Shop Hop ends in 3 more days!!!! 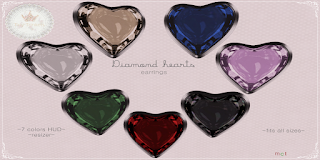 If you haven't already go check out that event join the group to get the HUD, once you get the HUD you will be able to teleport to the stores, then once you have been there for 1 min you will get a check once you get all of the checks on the HUD you will get a prize this months prize is from Paper Damsels. Items in this event is also 100l or less! The outfit i am wearing is from Babysteps, and Pose/Prop from Sassafras both for Shop Hop! 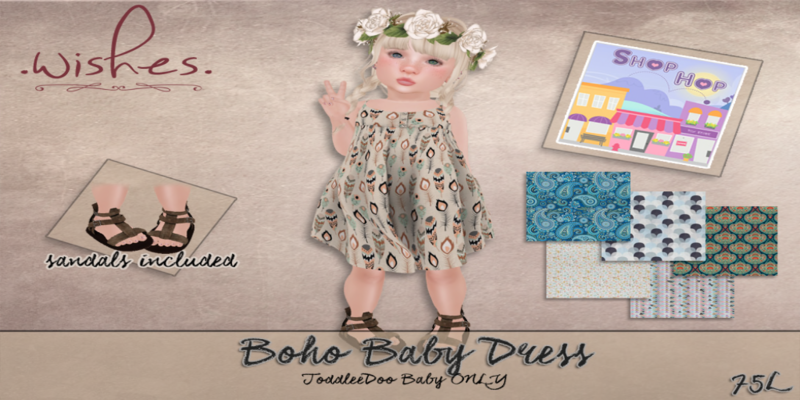 For this post i am wearing a cute outfit from Sweet tots from new release for both kid and baby toddleedoo, also the pose i am using is from xoxo for Shop Hop! both items are good for mothers day coming up! Happy Shopping! For this post i am wearing an adorable outfit Pestinhas comes in 2 colors but only for Baby. Its also a new release so if you haven't already go check it out! Happy Shopping! For this post i wearing a super cute dress from Buglets @ Ninety Nine for both kid and baby, it also comes in other colors you can choose from. The sandals from Empire! if you haven't already you should go to Ninety Nine there are some pretty nice things there Happy Shopping! For this post i am wearing a dress from Wishes on the Right. On the Left i am wearing a dress from Beau Bebe. Both items are in this month Shop Hop event witch is now open until the 13th! If you want more information about Shop Hop join the group in-world. to get the HUD and information. once you get the HUD you will be able to teleport to each store and then stay there for 1 min, once you are there for 1 min you will receive a check. Once you get all of the checks you will be able to get a prize, this months prize is sponsored by Paper Damsels. Happy Shopping! 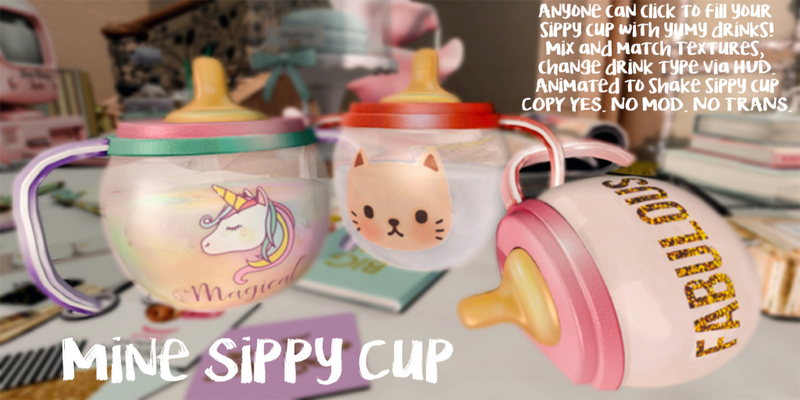 For this post i am wearing a super cute romper from Buglets, that is in this months Shop Hop event, also i am wearing super cute jewelry from Tiny Trinkets that is a gacha for The Play Room event now open. The pose i am using is from Confetti Poses that is at this months Once Upon A Child event, Last, the wall props i am using are from Ohana Inc that you will find in the Shop Hop event. 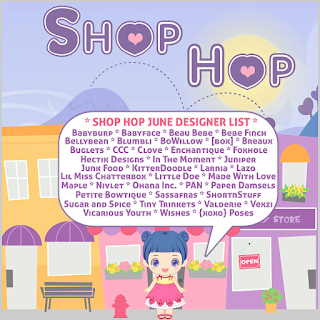 join the shop hop event in-world to get more information and the HUD. You then teleport to each store on the HUD and stay for 1 min you will get a check once you get all of the check you will be able to get a prize this months prize is from Paper Damsels! Happy Shopping!